Today’s date is April 5th; the Clashifer Hyper-Rush project began on 3/16, so that means we are just shy of 3 weeks into this brand new game (20 days). The goal was pretty straightforward - create a brand new game, then rush it as fast as fast can be to see how quickly we can advance while still maintaining a measure of sanity. Of course, there were some initial rules set up to guide the process - drop everything right away, buy only the $5-$20 level-up bonus packs (so no other financial investment), and keep Builders working around the clock with an immediate priority of knocking out whatever is needed to upgrade to the next level. On the HV, the game was at TH7 after 1 week. 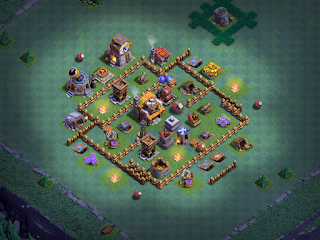 The initial seed money ($50) was used to get it to TH6 simply so the Builder Base and Clan Games would be available (TH4 and TH6, respectively). Since then, I’ve slowed things down a bit to focus on resource and troop upgrades. The HV isn’t really my focus here, though, and I’m not spending a great deal of time on raiding. Builders have been kept busy, however. The BB finished its upgrade to BH5 shortly after the Week 1 Update was released. Since then, I’ve been busily upgrading storages and troops. Unlike the HV, where you can choose your opponents, have 5 builders, and loot is virtually free flowing…progress on the BB is MUCH slower. After 2 weeks at BH5, today I pulled the trigger on the BH6 upgrade as well as Beta Minions level 10. It’s been a long haul, this last couple of weeks. I started off with L7 Beta Minions and slugged my way from about 1500 trophies to almost 2000 trophies. Defenses are still low level - the only defense I even upgraded was taking the Double Cannons to L2. Generally speaking, I used walls as a Gold dump, taking most to L3, and took the Wall Rings earned in a recent Clan Games to upgrade 5 pieces of wall to L4. Wall Rings are practically useless later in the game, but they’re great for getting lower level walls to a point where they can be useful in defense. The L3 -> L4 wall upgrade is the last one that can be done with a single Wall Ring. It also just so happens to be that L4 walls require 2 throws for the Bomber to take down (outside of the Big Bomb ability, of course, which takes down ANY wall in a single throw from L10 on). I repaired the Battle Machine but I won’t put any Elixir into him until later. At the moment, the plan is to start working on him at BH8; that might change as I get into BH7, though. BM upgrades slow down the game’s progress, so I prefer to keep him backburnered until closer to the end of the hyper-rush. Heading into BH6, I need Beta Minions to be L10. At 1800 trophies, I started seeing BH6 opponents; at 1900, they pretty much all had the Roaster. That greatly extended the amount of time required to get the 3 daily loot wins (lots of losses where I was simply outmatched). I was still only spending about 15-20 minutes a day on the game, often less. The additional 2 troop units per camp are going to be needed to work through the stronger BH6 bases. We talk a lot about underdogs on the forums, and I’ve discussed this in my videos/articles as well. The key to winning ANY match - especially underdog matches, though - is in your offense. My BH5 base is largely a L1 defender, yet, it still pulled in solid loot every day and is ending at nearly 2000 trophies. That’s strictly offensive play there. My wins are seldom defensive - the base is weak and has far, far fewer structures than BH6 opponents which means the other guy is going to get more percentage points for just about anything he destroys. The greater breadth of a higher level base also means I have to destroy more structures to win. That’s not to say defense can be ignored, though. The base design I use at BH5 is a solid one, even with weaker defenses. Having slightly higher level walls slows down ground attackers a bit as well. The BB is an offense-centric game, though, and your offense is what gets you over the finish line. I managed to time my resources right down to the last bit - I have 1.2M in Gold and 1.1M in Elixir; exactly what is needed for the BH6 upgrade and to take Beta Minions to L10. Those are 3 day and 2 day upgrades, respectively. I’ll raid each day while they’re upgrading, just to get a little extra resources socked away. The upgrade plan for BH6 will be as it is with others - storages and troops. I’ll do a few more strategic wall upgrades as well. My goal will be to get to BH7 as quickly as possible; I’m thinking that will require another couple-three weeks. Here’s the link to the latest video update in the series.